The trip to Salamanca as a meet-up represented the meeting in-person of a talented street photographer I had met online, among the sea of acquaintances I’ve made in my time practicing the art. Almost a year earlier, I’d “befriended” Javi Calvo via social media and in the time since have had the pleasure of interacting with him many times. When I had questions regarding the history of street photography in Spain, when I’d requested some names as signposts, he helped me source those histories and helped point me true in my research. In turn and in recognition for his collective’s work, I cited him in an article printed in a photography magazine last year. We’ve each supported the other’s work and thus, when the time came in the development of Crisol, my own street photography club, to travel “abroad”, an exhibition said collective had mounted in the municipal library in Salamanca became a natural choice. I’d learned of the show a month previous and had immediately contacted Javi and Javier Vegas, two members of the collective I’d come into contact with in my online travels. The two were interested and pleased with the idea that I’d bring a small group of photographers up from Madrid to see the show. They offered a guided tour, and a plan began to take shape. I announced the trip three weeks in advance, a trip by train to Salamanca from Madrid, and not surprisingly the number of RSVPs didn’t begin to approach the 15-person limit. In the end, just three of us traveled via train and another member traveled by car with his brother in tow to enjoy the outing. Javi met us on the train platform in Salamanca. He’d arrived with his girlfriend Leticia, another photographer, and greeted us warmly and following their lead we began the short trek into the city center. After a coffee at Cafe Erasmus we turned the corner and entered the library. The exhibition was positioned around the first floor, up a flight of stone stairs. This particular library is quite old, and features an arcaded courtyard and balustraded mezzanine, around which visitors to the exhibition could walk and take it in. Javi explained the series of photographs picture-by-picture, taking a little time to give some background about the particular features of each image. In this way, good pictures were afforded an extra layer or two of significance. Crisol members were shown how a photographer might go about explaining their work to an audience and at the same time were treated to insights casual visitors would likely miss. 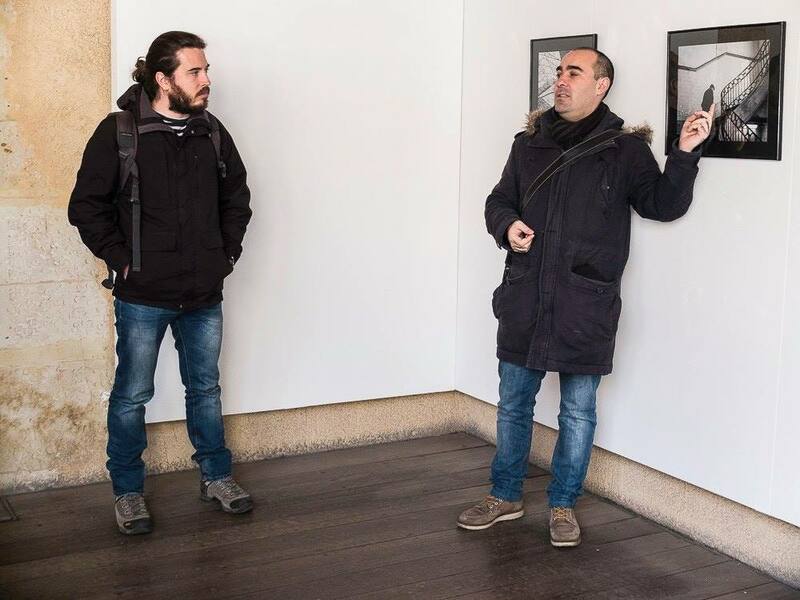 Antonio, another member of the Salamanca Street Collective, joined Javi in giving explanations and highlighting details of the works on display. I want to stress how awesome it was of them to host us in this way, with such warmth and care. The few of us that made the journey, we really enjoyed ourselves and are much richer for the effort and enthusiasm shown by our hosts. After the tour, we had lunch at a place Javi patronizes when he gives his workshops and of course, it was delicious. I had some patatas revolcanas, a dish typical of Avila, Javi’s hometown, and when she caught me waffling over dessert choices Leticia chose a honeyed yogurt for me that sealed the deal: Salamanca knows her Spanish cuisine. As the first group field trip, I feel that Salamanca was a great success. We made new friends, took some photographs, saw an exhibition, and didn’t break the bank or our bodies in long transport. Of course I arrived home exhausted, but class it as the kind of exhaustion you want to have at the end of the day, the kind that is paid by a deep and contented sleep. This entry was posted in Exhibition Visits, Photo Walks, Travel and tagged javi calvo, salamanca, travel.